Here is yet another epicurean post. 'Tis after all the season of baking right? I just can't help myself from concocting tasty treats from our fruitful harvest. I used lemon and orange in these two tooth decaying treats. For the LEMON SNOWBALLS I used a recipe I found online. They are delicate and full of chopped pecans and lemon zest. 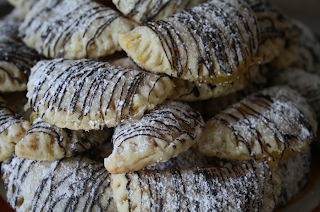 The Orange Zebra Turnovers are made from a few recipes that I combined to make my own creation. The filling is fresh orange pulp cooked with flour and sugar into a jelly like consistency. They too are delicate in texture and flaky. The dough is made with butter & cream cheese and not a drop of sugar. Final touch is to drizzle with dark chocolate and dust with powdered sugar. As you can see... 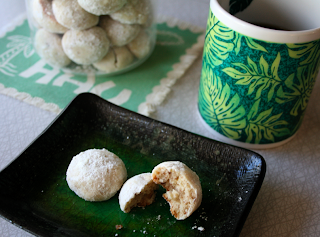 I enjoy starting my day with a few cookies and coffee.